When it comes to managing your personal or business accounts, you'll be able to quickly pay bills, transfer money, apply for certain loans and much more. For site security, HawaiiUSA FCU's software programs monitor network traffic to identify unauthorized attempts to upload or change information or otherwise cause damage to our system. For site management, information is collected for internal statistical purposes. A software program is used to summarize the information and assessments are made in areas such as system performance and design specification. No personal information, such as your name or address, is collected or used for this analysis. No information is collected to identify you personally. Our software does collect and store only the information about your visit to our web site. This includes: The Internet domain and IP address (the number automatically assigned to your computer while on the web) from which you access our web site. The date and time you access our site. The pages you visit and the result of the request. 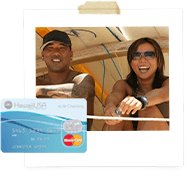 HawaiiUSA Federal Credit Union's web site contains "links" to other web sites for products or services we feel are benefits or of interest to our membership. HawaiiUSA Federal Credit Union assumes no liability for the content of these sites. Your name and address will not be sold to any mailing lists or to any merchants. We are in the business of serving our members and not marketing those lists to anyone. Any information disclosed to HawaiiUSA FCU in the normal course of business will be held in confidence. Heat Mapping services are used to display the areas of a page where Users most frequently move the mouse or click. This shows where the points of interest are. These services make it possible to monitor and analyze web traffic and keep track of User behavior. Some of these services may record sessions and make them available for later visual playback. At HawaiiUSA Federal Credit Union, we are committed to providing "Life matters" moments and financial education to our members, staff, and community. Bank at any of our Oahu, Maui, or Big Island branches, enjoy online and mobile banking, call us at (808) 534.4300, toll-free at (800) 379.1300, or say Aloha on any of our social media pages below! If you are using a screen reader or other auxiliary aid and are having problems using this website, please contact our Call Center at (808) 534.4300 or toll-free at (800) 379.1300 for assistance. © 2015 HawaiiUSA Federal Credit Union. All rights reserved.